Frontispiece: As the four Turtles trick-or-treat with Shadow and a giant Swamp Thing-like monster, they consider how Halloween is a holiday where otherworldly creatures come out for one night only. They consider it not only the best time of the year, but also their time of the year. Down in the sewers, the Turtles receive a surprise visit from Renet, showing off her new outfit and time scepter. Unfortunately, she can’t figure the stupid thing out and mistakenly zaps the TMNT, sending them to another dimension. Arriving in a dark forest, the first thing they notice is a gingerbread man being attacked by zombies. The Turtles dismember the undead and the gingerbread man introduces himself as Gutwallow. He says that they’re in the land of Moonsorrow and the zombies belong to the Necromancer. Unfortunately, he can say no more as its Samhain Night and he needs to gather the mandrake root he was looking for and get going. Confused, the Turtles decide to search for anyone who can send them home. Conveniently, they find a sign pointing toward the abode of the Chronomancer. The path, unfortunately, crosses werewolf country and the giant canines chase the TMNT to a sheer cliff face. The werewolves glimpse a forboding castle at the top of the cliff and scamper off. The Turtles wonder what they were so scared of as the wall behind them slides open and they are pulled into a cave by zombies. They’re in the lair of the Necromancer, now, and the hooded fiend zaps them with a paralyzing spell. Leaving them in his laboratory, the necromancer plans to turn them into zombie slaves. Luckily, Gutwallow happens to be in the lair and uses the mandrake root he acquired to create an antidote for the TMNT’s paralysis. He leads them to the front door of the castle, which happens to be guarded by a huge tentacle-monster. In another swell coincidence, the monster happens to have a huge aversion to gingerbread and flees at the taste of Gutwallow. The gingerbread man tries to lead the Turtles back through the forest, but is plucked up in the claws of a dragon. The Turtles chase the dragon to the ruins of an old castle, where they are attacked by a vampire and his brides. The bloodsuckers are immediately incinerated by the dragon, though, as the monster (named Puff), happens to be a friend of Gutwallow’s and was just happy to see him. Riding on Puff’s back, Gutwallow takes the Turtles to see the Great Oogly Moogly, who may be able to send them home. The kind wizard shows them an artifact he recently purchased from several dwarves who claimed it belonged to a princess: Renet’s time scepter. Figuring the “princess” to be Renet, they take the scepter and follow Gutwallow to the home of the dwarves. Knocking on the door, they’re greeted by a very disheveled Renet. Apparently, she came to Moonsorrow after them but was jumped by a bunch of dwarves, who enslaved her as their new housekeeper. The dwarves suddenly break down the door and Renet decides they should just go already. Sending the Turtles back to the sewers, she returns to her home in Null Time. But wait! Shadow wants to know what happened to Gutwallow. Thinking fast, Mikey grabs the stuffed gingerbread man and explains that the time scepter accidentally transformed Gutwallow into a doll and they’re still waiting to hear from Renet again before he can be restored. Shadow promises to keep Gutwallow safe from monsters until Renet comes back for him, and cuddling the little guy, falls asleep. As Mikey leaves, wishing Shadow a “Happy Samhain”, the gingerbread man slyly winks at the audience. 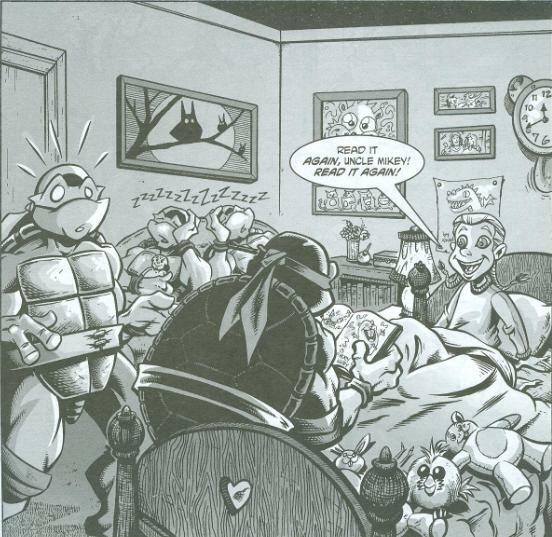 *Chronologically speaking, the Turtles last met Renet in TMNT (Vol. 1) #47. 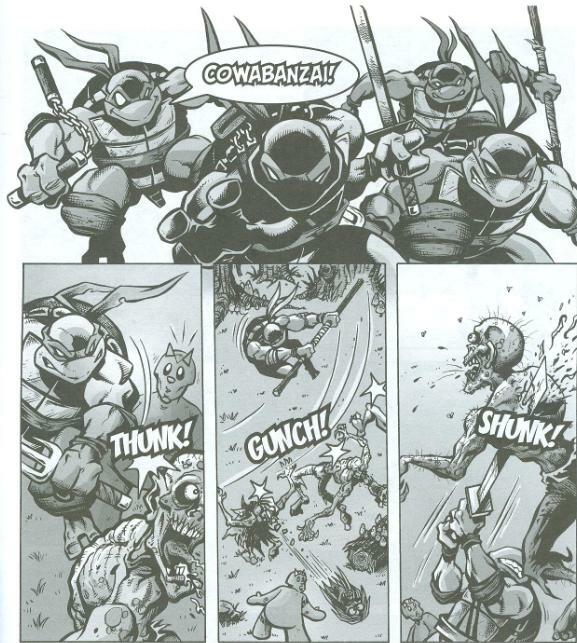 They'll encounter her next in Tales of the TMNT (Vol. 2) #69. *Gutwallow is an original character, created and owned by Dan Berger, that originally appeared in a minicomic published in 1996 then proceeded to appear sporadically in comics such as Digital Webbing Presents for the next several years. The majority of Gutwallow’s appearances have been collected in a trade paperback titled “The Fury of the Furry”. *Raph previously fought a werewolf in “The Howl”. *This issue also contained a bonus pin-up, “Guest of Honor” by Dan Berger. To be perfectly honest, I’ve never read any of Gutwallow’s other appearances so I don’t know anything about the character or his world beyond this little crossover story. In fact, I hadn’t even heard of him before reading this comic. No offense to Berger intended; there are probably lots of good comic book characters I’ve never heard of. 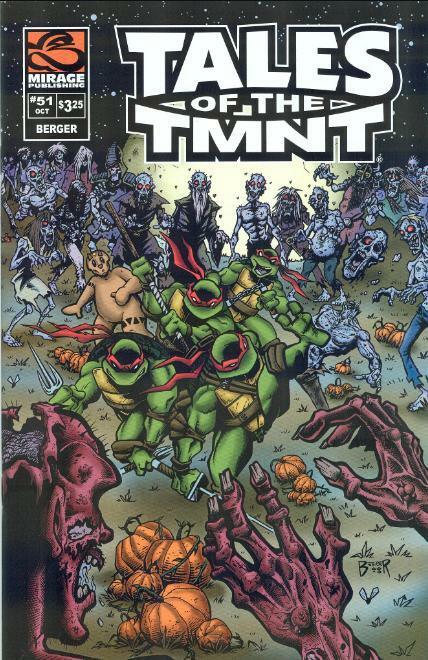 “Night of the Living Gingerbread” is another great display of how fundamentally Berger understands each of the characters, especially Michelangelo. While the Image series made a big deal about it, the Mirage series never went anywhere with Mikey’s love of writing and creative aspirations. 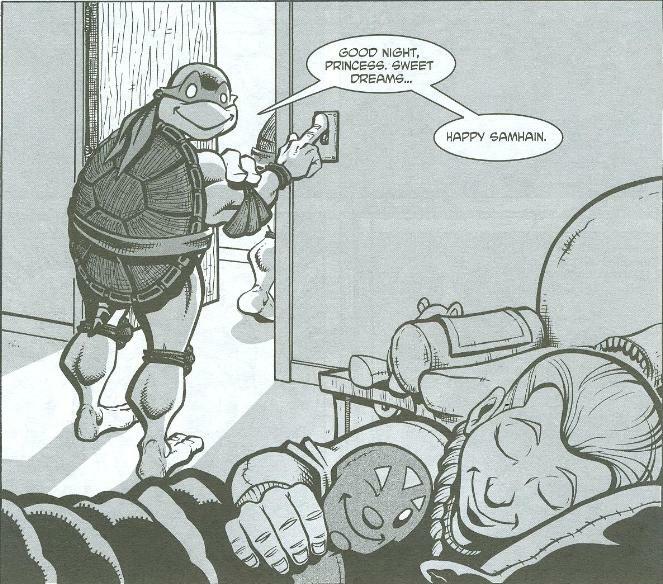 This story was a nice use of that character element, as Mikey utilizes his imagination to craft a fun bedtime story for Shadow. It’s also a nice spotlight on the relationship between Mikey and Shadow, as they were always shown to be closest in Shadow’s developing years. I was a little disappointed that in stories where Shadow is older (teenager or young adult), there’s very little interaction between them; Shadow seeming to have gravitated toward Raphael in her rebellious teenage years. It makes narrative sense, don’t get me wrong, but I always wanted to see Mikey’s reaction to “losing” his little princess. To sew this tangent up, it just seemed like a dramatic missed opportunity. Anyway, Berger’s highly expressive and animated art style fits the fun and humorous nature of his script like a glove (surprise, surprise), though it’s also a good illustration of his darker skills that lean toward horror, with rotting zombies getting dismembered and such. Berger has always been a strange artist in that his style at a glance seems very “goofy”, yet it complements many of the darkest and most dramatic TMNT stories ever written (“Leatherhead, Too”, “Cold, Cold Ice”, “Dark Shadows”). While his tendency to mix cartoony, squash-n-stretch visual gags with suspense and pathos might seem like an incongruous juxtaposition, there’s no denying that he always manages to strike the necessary balance between the two. It’s just one of the elements that gives Berger’s stories their unique identity and charm. While this issue doesn’t so much mix the drama in with the humor, being mostly a comedy relief piece, it’s still a good display of his talents, as it combines darker fantasy with lighter fairy tale stuff. And he just draws an adorable Shadow. Seriously, read this issue back-to-back with “Dark Shadows”. It’ll break your heart. A few parts of the story didn’t click with me so much and I’m not sure if it was because I’m not acquainted with the Gutwallow character or if it was an intentional “Mikey’s phoning it in” plot point. Why was Gutwallow in the lair of the Necromancer? Does he work for him? He maybe could have dropped a line somewhere mentioning his employer just for the sake of those who aren’t familiar with Gutwallow’s series, that’s all. But even if he was employed by the Necromancer, then why were his zombies attacking him? “Night of the Living Gingerbread” is a very cute story with fun and energetic art. It may seem inessential on a narrative level, as it’s a total one-off, but I think it’s a great character spotlight for Mikey’s literary creativity (something Mirage elected to forget about) and his bond with Shadow. Just about any issue drawn (or written) by Dan Berger is a real treat! I was kinda hoping you'd review the Monsterex issues of the Archie-verse for the Halloween season, but then I remembered you were holding off on the Specials until you finish the main continuity. Oh well... maybe next year, eh? I loved the little reference to Calvin and Hobbes at the beginning. Good ol' Hamster Huey.